Have you ever tried forming a new habit? What about sticking with a New Year’s resolution? Achieving a lofty goal? What you’ve probably experienced, or read about, is that writing down an affirmation of your new routine in a highly visible area of your life is one of the best ways to get a step closer to realizing said accomplishment. The same holds true when you’re telling your target audience about your product or service. 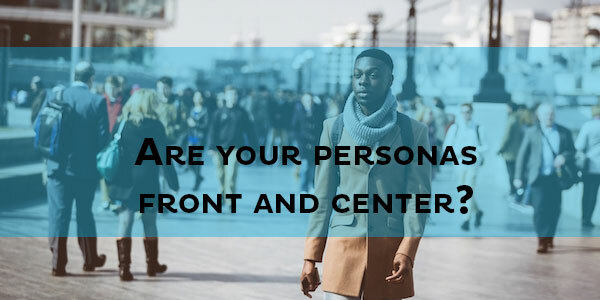 And yet, when deadlines are fast approaching and your content team is looking to ship, ship, ship, what strategies do you have in place to ensure you’re speaking precisely to your persona? Think of ways to get your team excited about using personas, and ensure everyone creating content understands your target audience and how to speak to them. Give each persona a name, pull images, create Fatheads and hang them on the wall. Bring them to life, and they’ll stay top of mind. This holds especially true for organizations with a large number of contributors, or if your team has recently grown. HubSpot uses a stuffed teddy bear named Molly. Molly is in attendance at management meetings and represents the customer. Meetings often include the question, “What would Molly say?”. Amazon CEO Jeff Bezos signifies the need for top-notch customer awareness with “the empty chair.” A seat is intentionally left open in meetings as all attendees are encouraged to think of it as being occupied by the most important person in the room: their customer. This physical representation serves as a reminder of their customer-focused purpose. In other instances, I’ve seen large posters adorned with the persona’s name, full portrait, and a few key stats that bring them to life, placed in a highly trafficked area of the business. These not-so-subtle daily reminders create lasting habits throughout your workforce. Targeting specific prospects based on persona and buying stage is an oft-preached best practice, but it quickly falls by the wayside when marketers feel underwater. Unfortunately, this leads to irrelevant and valueless content. Instead of saving time, you’re wasting it on a final product that won’t get any traction. So take a moment, or five, to think intrinsically about your persona and company culture and find an appropriate solution. Make it real, make it visible, and be sure to revisit often, as your persona may change over time. Then tell me in the comments: what will be your teddy bear or empty chair?